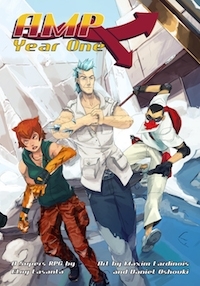 AMP: Year One is a complete RPG published by Third Eye Games. Welcome to the latest Designer’s Diary, a column where designers are given the opportunity to take readers on an in-depth ride through the design and development process of their system, setting, or product. If you’d like to share your product in the Designer’s Diary column, send a message to aaron@roleplayerschronicle.com. AMP: Year One is an in-depth look at my idea of what the first year of people having powers may be like. The tagline during the Kickstarter became “No heroes. No villains. Just hard choices.”and it became a defining theme while development continued on the game. There are no spandex-wearing, heroic types and there are no evil, mustache twirling bad guys who rob banks for no reason. It’s all about what happens when a person, not unlike you or I, gets powers they don’t understand and may not be able to control. The system is easy-to-learn and is a different take on the DGS than I’ve previously used, called the DGS-Combo. I wanted a system that seamlessly integrated the powers into the flow of things. There’s not a different system for every kind of check. There’s one mechanic that is present throughout the entirety of the game, which is what makes it probably the best system I’ve designed to date. AMP: Year One, however, gives a unique approach to the genre. I didn’t want to gloss over the rise of AMPs (people with Accelerated Mutant Potential). Instead, I wanted to put the experience of what it was like to first discover powers on both a personal and societal level under a microscope and really dissect it in a way that hadn’t been done before. Other games have had timelines, but they were there mostly to “catch the reader up on where the game now stands.”AMP: Year One attempts to use its timeline to really tell an ongoing story that hopefully reaches out and grabs the reader, asking questions of what it means to be human and poses many philosophical questions to get people thinking. So, to sum up… I wrote it because there’s nothing like it out there. If there was, I would have jumped on that game instead of writing my own. AMP: Year One actually had quite a few influences, which I detail in the book itself as well. I’ll give you a few so that you can get a feel for what this game is trying to replicate. The movie Push was a big influence, as was the the TV shows Heroes and Misfits. These are all modern day settings without the traditional superheroes that many other platforms try to create. Of course, the biggest influence above everything else was X-Men in all of its forms (movies, TV and comics). That singular Marvel comic, as well as X-Force, Xcalibur, and every other X-Whatever storylines, were a huge influence on me growing up. I’d pretty much spend my allowance on anything with an X on it. The modern movies coming out, however, really help to put those old ideas within the construct of modern society, what some are calling Iron Age comics. Dark, gritty moods and themes that really make someone feel and think. That’s what I wanted to recreate with AMP: Year One. Not just trying to make a game that people can play the same type of games they can already do with Mutants and Masterminds or ICONS or HEROES or any of the other awesome supers games out there. I wanted something to invoke emotion. System-wise, the DGS-Combo system definitely borrows heavily from the DGS-Lite system created for Part-Time Gods. I loved the Bonds system for that game, but it didn’t really fit into what I wanted AMP: Year One to feel like. So, I kind of meshed the Passions from Apocalypse Prevention, Inc. with the Bonds from Part-Time Gods together and ended up with Loyalties, and they are quite awesome. The DGS-Combo is different enough from other DGS games to be truly distinct, but similar enough that if you’ve played any of my previous games, then you pretty much already know how to play AMP: Year One. I watched a lot of TV and movies and read a lot of comics to prepare for AMP: Year One. It was an excuse to try out Alphas, to watch all of the new Marvel movies and to expense the purchase of a ton of new comics that I’d never read before. Other than that, I did real-world studies of reports on super-solider experiments actually conducted in the past and the effects on the subjects that survived. There are some terrible events that have happened in our past and I only touch on the feel of them in AMP: Year One. I had a pretty clear idea of where I wanted to go with how powers worked in AMP: Year One. To me, it was totally unique, but I needed to make sure. So I went out and played as many supers RPGs as I could get my hands on (which was a lot). In the end, I was happy with the way my powers were organized and how they worked. They are easy to use, easy to understand and flow in a logical way that players are enjoying thus far. So that makes me pretty happy. I had been writing AMP: Year One for about a year before I decided to start looking for the right artist. I had a lot of artists that I routinely used for some of my other games, but I wanted a look I’d never had before for AMP: Year One. I came upon Maxim Lardinois on DeviantArt. His cartoony, yet realistic and highly stylized approach really makes AMP: Year One standout from other supers games. He really had a grasp on how to make black and white art come alive as well. This book has more art than any product I’ve put out to date, so it’s impressive that he produced truly awesome pieces. I did call up my friend Daniel Wong (previously seen in my Ninja Crusade games) to help fill in the gaps that Maxim wouldn’t able to hit due to deadlines and both of them knocked it out of the park. They both know how to read my mind and deliver amazing work off the barest of descriptions, so I’m a lucky art director. The gaming experience follows the name of the game line, AMP. It’s high-energy and extra focused on delivering a crazy awesome time. One of the unique things implemented to help deliver on this promise is the Juice system. Juice are the “power points” used to activate each individual AMP’s power, which is directly connected to their adrenaline. How we portrayed this in the system is that each player gets Juice chips that they spend to use powers, but as their adrenaline gets pumping, they gain more back. In essence, putting yourself in danger gets you more Juice to use your powers, which probably gets you into more danger, which then gets you more Juice and it becomes a crazy, skinny cycle of crazy times. Despite how insane the gameplay becomes, AMP: Year One is firmly rooted in its setting and the modern day. There aren’t any Superhero Headquarters, sanctioned heroes or leagues of supervillains. Every character is an individual and becomes the most important AMP in the world. Even if there are others, this story isn’t about them. It’s about YOU. Comparing AMP: Year One to its predecessors in Third Eye Games is pretty easy. I’d say that development of Apocalypse Prevention, Inc., Wu Xing: The Ninja Crusade, and Part-Time Gods has led up to this moment and each of them feeds into what AMP: Year One eventually became. It has the mystery and intrigue of Apocalypse Prevention, Inc., the crazy action of Wu Xing: The Ninja Crusade and the social awareness of Part-Time Gods all in one great package. It also adds another genre to Third Eye Games’ offerings, making our company even that much more appealing to a wider range of fans. I think I’ve compared AMP: Year One to the other supers games out there earlier in the diary, but I want to give a nod to them all again. AMP: Year One is nothing like any of them at this point. Setting-wise it’s similar to Progenitor or Brace New World, but even scratches a different itch than those titles. System-wise it’s a happy marriage of influences from Mutants and Masterminds, Aberrant and ICONS, without actually being anything like any of those games. I respect all the games already in this genre of RPGs and know that AMP: Year One holds a special niche among them, delivering something none of the others do. I had a great idea for what I wanted the setting to be when I sat down to work on AMP: Year One. I did a quick in-brief document so I had the gist of it for myself and then started working on powers. From my research into people who play Supers games, the powers are the most important thing, so I had to make sure to get them exactly right. About 4 months of the entire development process was spent figuring out what powers to include, how they’d be structured and how they’d combine for extra effect. After that came everything else, figuring out character creation guidelines, play testing, mechanics for other aspects of play, etc. When all of that was done and I knew everything that a character could do, I started work on detailing the setting and really using it to show off the system thematically. I payed special attention to powers that others might not see as powerful, like Astral Projection or Hyper Intelligence, and show how these can be used in unique ways by portraying characters in the setting using them outside the norm. The end process is a complete game that stand outside the norm of other supers RPGs as well. We’re very proud of the final product which debuted at GenCon 2014.